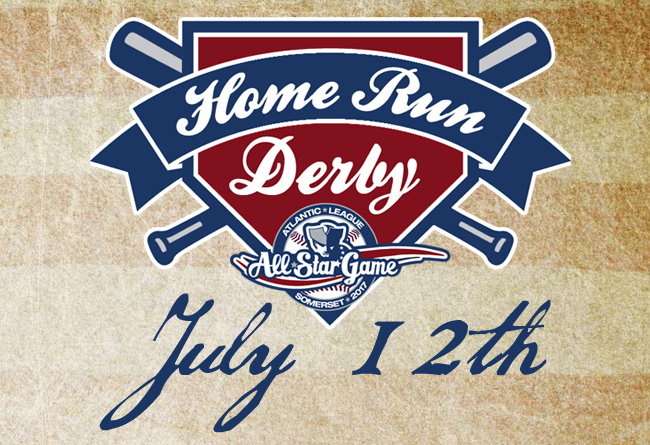 (Bridgewater, N.J., July 10, 2017) - The Atlantic League of Professional Baseball and the Somerset Patriots have announced the participants of the 2017 All-Star Game Home Run Derby to take place at TD Bank Ballpark on Wednesday, July 12th. The six participants were among the top home run hitters from the first half of the 2017 season. Sean Halton (15 home runs) and Garrett Weber (11 home runs) of the Lancaster Barnstormers, along with Zach Wilson of the Southern Maryland Blue Crabs (12 home runs) will represent the Freedom Division. Angelo Songco of the Long Island Ducks (14 home runs) will be joined by Conor Bierfeldt (13 home runs) and Michael Crouse (11 home runs) of the New Britain Bees to represent the Liberty Division squad. The event will begin on the field at 6:00 pm and will be emceed by New York Yankees broadcaster John Sterling and Somerset Patriots radio broadcaster Marc Schwartz. Sterling has served as the play-by-play man for the Yankees since 1989, having never missed a single game in his 27 seasons in the broadcast booth. This streak includes a notable 2005 season where Sterling called every single pitch of every Yankees game that year. The format of the Home Run Derby will be a two-round contest with all six participants hitting as many home runs as they can before reaching seven outs in the first round. The top two home run hitters will advance to the final round, where they will see who can hit the most home runs before reaching 10 outs. Each round will have tie-breakers if necessary. The winning player will receive the All-Star Game Home Run Derby Champion Trophy.